Members of The Avengers have assembled and this time in order to help support a young Marvel fan name Chris, who is battling cancer. 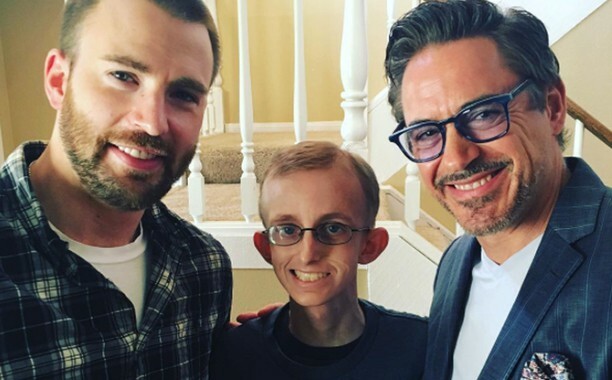 Chris Evans, Gwyneth Paltrow and Robert Downey Jr. traveled to meet Ryan Wilcox. A social media campaign started using the hashtag #RyanStrong and explaining that Ryan is a massive Captain America fan. Paltrow found out about the campaign and learned about Wilcox’s illness (Secondary Myelodysplastic Syndrome). As a result, Paltrow arranged for herself, Evans and Downey Jr., to fly to San Diego and meet Ryan and his family. Paltrow documented the journey on Instagram, from their landing to meeting Ryan. Before the Avengers team arrived in San Diego, Evans had sent him his own personalized video encouraging him to “keep fighting” and thanking him for his ongoing support and allegiance to Captain America.